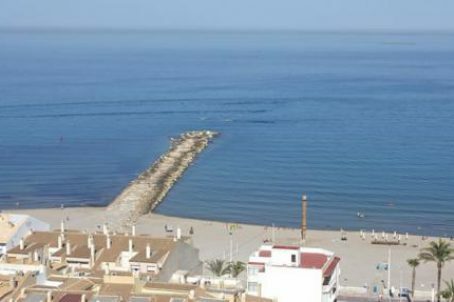 A 4 star hotel at the Costa Blanca, 10 km from the center of Alicante, and a 50 meters from the beach, separated from the promenade by a big square with fountains. The hotel is overlooking the sea and it is located near the two more commercial streets of the town. The International Airport of Alicante is about a 25 km. It is a modern and functional building with 9 floors, 101 rooms (including 2 suites and 3 rooms adapted for disabled people), also there are several outbuildings for restoration, services and underground parking. All the rooms have a terrace with the sea view, safe, mini - bar, TV and fully equipped bathroom. On the top floor (attic) there is a restaurant with beautiful sea view for 50 people capacity. Includes also: - 2 coffee shops, one of them in the pool area. - 2 lounges for weddings and other events with capacity for up to 250 and 150 people respectively, fully equipped with audiovisual technology and telecommunication systems. - Reading room and TV. - Children room. - Gym. - Sauna. - Massages area. - Jacuzzi with showers. - Swimming pool with children area, deck chairs and parasols. - Underground parking with 100 parking places. - 3 fully equipped kitchens with fridge cameras and refrigerated rooms for food preservation. - Panoramic elevators. The town has 2 ports close to the Hotel: The marina which has many restaurants, specialty shops and capacity to 476 moorings and the Fishing port, with special auction, known as "fish auctions". The Hotel also offers two meeting rooms with a capacity of 150 and 250 people respectively. The halls are interconnected through a panoramic elevator and prepared for any type of celebration. One of the rooms has a large stage for holding different events or parties.The panoramic restaurant has one of the best views of the Costa Blanca. In the restaurant you can also taste some of the best dishes of the Mediterranean Gastronomy and delicious Tapas, drinks and great menus of the day or while watching the sea tasting. Recently the pool area has been reformed. The hotel is located a few meters from the promenade and its 101 rooms are oriented towards the sea to enjoy breathtaking views of the Mediterranean.